The calendar year 2013 was filled with many notable moments of accomplishment, celebration and reflection at the University of Notre Dame. Here are some of the significant events. The Hesburgh Libraries began celebrating its 50th anniversary with a ceremony kicking off its schedule of events throughout the 2013-14 academic year. Events have included a lecture series, exhibits and opening the Center for Digital Scholarship. The center, which opened in November, features a Digital Research Lab that includes access to a 3-D printer, a large-format color printer, a high-tech conference room and a flipped classroom, and a Digital Production Facility that features state-of-the-art digitization equipment. The Mendoza College of Business ranked No. 1 in Bloomberg Businessweek’s annual ranking of “Best Undergraduate Business Schools” for the fourth year in a row. The college’s Executive MBA program also was ranked No. 15 in the world by The Economist in July. Notre Dame International announced it will offer three new study abroad opportunities in South Korea, Spain and Switzerland in spring 2014. Notre Dame ranks fifth nationwide in percentage of undergraduate students participating in study abroad programs among U.S. doctoral/research institutions, according to the Open Doors report released in November by the Institute of International Education. The 2013-14 Notre Dame Forum, titled “Women in Leadership,” began in September with an event featuring Michèle Flournoy, the highest-ranking civilian woman in Pentagon history, and Gen. Ann Dunwoody, the first woman to achieve the rank of four-star general. Cardinal Timothy Dolan, archbishop of New York and president of the U.S. Conference of Catholic Bishops, was the principal speaker at the University’s 168th Commencement Ceremony on May 19, where he also received an honorary degree. Sister Susanne Gallagher, S.P. ; Sister Mary Therese Harrington, S.H. ; and Rev. James H. McCarthy, founders of the Special Religious Education Development Network, received the University of Notre Dame’s 2013 Laetare Medal. Mallory Meter, a psychology major from Beverly Hills, Mich., delivered the valedictory address. The Keough-Naughton Institute for Irish Studies celebrated its 20th anniversary with numerous public events including a choral concert, a Mass, a lecture and an all-star exhibition hurling game. Gifts to the University totaling more than $60 million will allow for the construction of three new buildings on campus. In September, Robert S. and Elizabeth Nanovic made a leadership gift to Notre Dame for the construction of Nanovic Hall, a new social sciences building in the College of Arts and Letters. Also in September, alumnus Matthew Walsh and his wife, Joyce, made a $27 million gift to Notre Dame. In recognition of the gift, the University will name in their honor a new building for the School of Architecture. 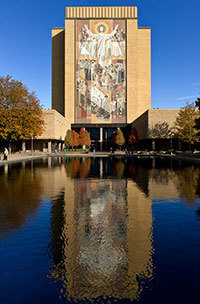 In October, Notre Dame announced that Donald and Marilyn Keough made a $30 million gift to the University to underwrite the construction of a new building for its international institutes, to be named in honor of President Rev. John I. Jenkins, C.S.C. A new telescope, one of the largest in Indiana, was installed on the top of the Jordan Hall of Science in September. The Krizmanich telescope will provide students with cutting-edge astrophysics research experience as well as provide opportunities for community events. In April, Notre Dame announced that the Global Adaptation Index was moving to the University. The world’s leading index showing which countries are best prepared to deal with the droughts, superstorms and other natural disasters resulting from climate change released its 2013 report in December. The ND-GAIN index results showed that the world’s poorest countries lag 100 years behind the richest in preparing for climate change. A group of scientists, led by faculty at the University of Notre Dame, published in the journal Nature Chemical Biology that it has made concrete progress toward the development of the first-ever inhibitory therapeutic for Type I hypersensitive allergic reactions, including food allergies. Notre Dame high-energy physicists received a $2.4 million, three-year award from the National Science Foundation to continue their work on the Compact Muon Solenoid experiment on campus and at CERN, the European Organization for Nuclear Research. The group’s work includes physics analysis central to the recent Higgs boson discovery, which earned its discoverers the Nobel Prize in physics. A Notre Dame research team developed a tablet-based testing system for concussions and traumatic brain injuries. The app captures the voice of an individual and analyzes the speech for signs of a potential concussion anytime, anywhere, in real time. Results of the Economic Impact Report conducted in 2012 were released, showing that through employment, spending, students, visitors and research, Notre Dame brought $1.167 billion in economic activity and 13,766 jobs to St. Joseph County that year. In August, Douglas Road north of campus reopened after undergoing construction to re-route the road through White Field. The project improved safety for motorists and pedestrians with the installation of two roundabouts and two HAWK crosswalks, and opened up 120 acres of University-owned property for future development. In the fall, Rev. John I. Jenkins, C.S.C., University president, announced the creation of a President’s Oversight Committee on Diversity and Inclusion, whose purpose is to extend and deepen the diversity and inclusivity of the campus community. The University endowment returned 11.8 percent for the year ending June 30, said Scott Malpass, vice president and chief investment officer. The endowment pool grew from $7.4 billion on June 30, 2012, to $8.3 billion on June 30, 2013. 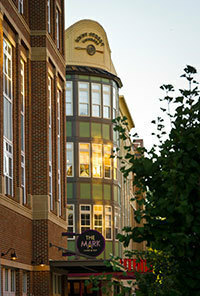 In September, the Morris Inn opened after undergoing extensive renovations that earned it a Four Diamond rating from AAA. It is seeking LEED Silver certification from the U.S. Green Building Council for the building’s design and construction. For the fifth year in a row, the Chronicle of Higher Education named Notre Dame to the honor roll on its annual list of Great Colleges to Work For. The honor roll, the Chronicle notes, recognizes the “best of the best” among the colleges surveyed for the list. Notre Dame announced in May that it is exploring an innovative approach to campus planning that would take advantage of the central location of the football stadium to make it a hub for, among other possibilities, a student center, media center and classroom and conference center. For the eighth time in nine years, the University ranks No. 1 on a percentage basis in terms of number of Graduation Success Rate scores among all NCAA Football Bowl Subdivision schools, with a 0.909 percentage. The Notre Dame men’s soccer team won the national NCAA championship in December, the first time the team has taken the title. The University joined the Atlantic Coast Conference for athletic competition in all sports except football and hockey beginning with the 2013-2014 season, leaving the Big East Conference. The 2013 football season ended with an 8-4 record and an invitation to the New Era Pinstripe Bowl at Yankee Stadium in New York on Dec. 28 (Saturday). The Fighting Irish will face Rutgers in the postseason bowl game, the team’s eighth bowl appearance in the last 10 years. The Notre Dame football team went to Texas for its Shamrock Series, playing Arizona State at AT&T Stadium in Arlington. The Fighting Irish won 37-34. In addition to the game, the Notre Dame community also hosted service projects, discussions, Mass and a celebration of Texan culture and traditions, including a march through Fort Worth by the Notre Dame band, accompanied by a herd of longhorn cattle. 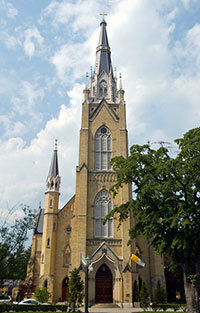 In December, Notre Dame re-filed a lawsuit in the U.S. District Court for the Northern District of Indiana for relief from a mandate by the U.S. Department of Health and Human Services that, contrary to Catholic teaching, requires Notre Dame and similar religious organizations to provide through their insurance plans or third-party administrators contraceptives, sterilization procedures and drugs that some assert induce abortions. In August, the Basilica of the Sacred Heart celebrated the 125th anniversary of its consecration with a special Mass and reception. The Basilica will close for three weeks at the end of 2013 to undergo renovations that include removing the carpet and installing slate tile flooring. In May, Rev. Theodore Hesburgh, C.S.C., president emeritus, went to Washington, D.C., for a celebration of his achievements and accomplishments on his 96th birthday. He met with President Barack Obama, House minority leader Nancy Pelosi, Vice President Joe Biden, alumnus Ambassador Tim Roemer and many others. In April, Father Hesburgh was recognized as an honorary Navy Chaplain in a special ceremony. The Alliance for Catholic Education embarked on a Fighting for Our Children’s Future National Bus Tour, a cross-country effort to raise awareness of the impact K-12 schools have on the future of the nation’s children and to celebrate the role Catholic schools play as agents of formation. The tour marked the 20th anniversary of ACE’s founding. Originally published by Brittany Collins at news.nd.edu on December 20, 2013.